DJI, the world leader in unmanned aerial technology, Sunday unveiled the new Matrice 200 drone series (M200), which is purpose-built for professional users to perform aerial inspections and collect data – making drone technology an affordable and easy-to-use tool for enterprises that recognize how aerial imaging can transform their operations. Critical Infrastructure Inspections – work near power lines, telecommunications towers and bridges puts inspectors at risk of falls and electric shock. DJI’s M200 improves safety as work can be done from a distance. The M200 can identify millimeter-sized faults in buildings, roads and bridges in real time, making those operations more safe, efficient and effective. Energy Facility Inspections – maintenance planning can be costly and time-consuming. With the stable and weather-resistant M200 platform, extensive power line networks can be visualized with unparalleled detail and vertical infrastructure, such as wind turbines and offshore oil rigs, can be inspected from all angles. The M200 series comes in three versions. The standard M200 is equipped with one downward-facing gimbal mount. The M210 opens up for multiple payload configurations – one single downward facing gimbal mount, two parallel downward-facing gimbal mounts or one upward-facing gimbal mount. The M210 features additional connectivity ports to support third party sensors and accessories. The M210 has the capability to support additional sensors in the future and additional payload can be mounted on top of the aircraft. The M210 RTK is available with D-RTK modules for centimeter-precision navigation. With an IP43 classification, the M200 series is built to endure adverse environments. The aircraft is equipped with more than 20 internal sensors for maximum redundancy and reliability, including compass, GPS system, dual inertial measurement units (IMUs) and three barometers. Gimbal controllers have been integrated in the aircraft body for protection and to prevent drift. The aircraft features two stereo-vision systems below and in front of the aircraft and has an upward facing infrared sensor for obstacle avoidance. A redundant battery system improves safety and also allows the craft to stay powered while batteries are swapped in sequence. The M200 series features DJI AirSense, a built-in ADS-B receiver, enhancing airspace safety by automatically providing the operator with real-time information about the position, altitude, and velocity of nearby manned aircraft equipped with ADS-B transmitters. AirSense enables safer and more efficient use of airspace, particularly in locations where other manned aircraft may be operating. The M200 series is also equipped with an integrated flight controller, featuring two IMUs and a GNSS unit, with additional analytical redundancy systems. Working together with advanced diagnostic algorithms, it can seamlessly switch from one IMU to the other to maintain reliability and precision. In addition to the DJI GO 4 app, the M200 series supports the brand new DJI Pilot app, which is specifically designed for enterprise users, optimizing user experience and flight performance. Users can also plan flights through DJI’s GS Pro app, which uses a clear and concise interface to establish complex flight missions with just a few taps. 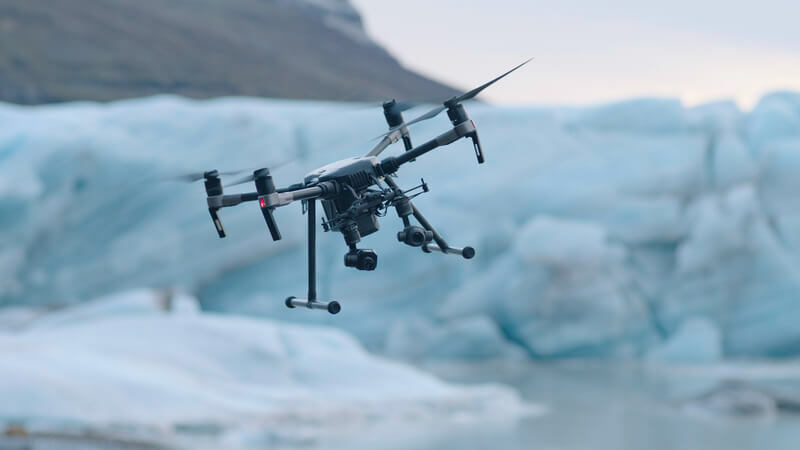 The M200 series is compatible with DJI’s Mobile and Onboard Software Development Kit (SDK), enabling programmers to build customized solutions for flight planning, data collection and analysis. The DJI Pilot app is compatible with DJI FlightHub™, a web-based software package allowing teams to share real-time data with offsite parties over the Internet. This includes remote emergency situation control rooms keeping track of first response teams or asset management centers inspecting global infrastructure networks. In an easy-to-use control center, DJI FlightHub lets users plan flights with multiple drones and keep track of each aircraft’s status. An offsite control room can simultaneously monitor live feeds and can remotely control gimbal and camera. The software enables managers to plan flights in advance using waypoints and dynamic geofencing. The M200 series pairs with DJI Goggles, displaying an 85-degree view from the drone in full 1080p for a bird’s-eye view of the world below. 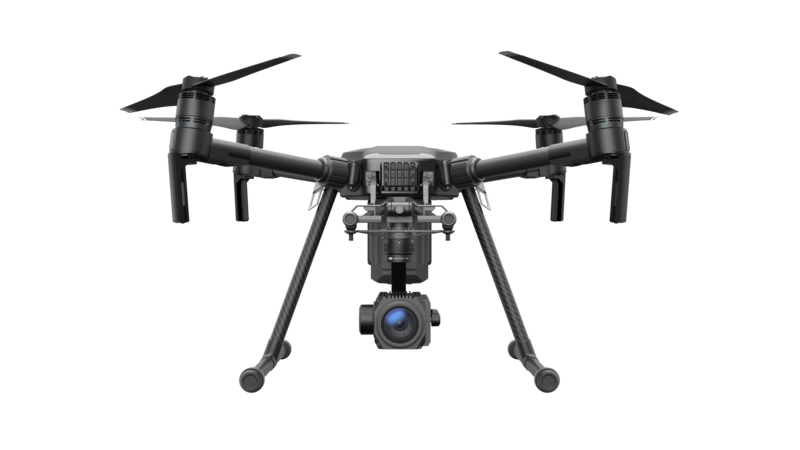 The M200 series uses DJI’s powerful Lightbridge system, supporting a range up to 4.3 miles (7 km) where, allowed by local laws and regulations, at live view resolutions up to 1080p. The master and slave controller range extends to 328 feet and users can switch between 2.4 GHz and 5.8 GHz frequencies to cut through any noise for greater signal stability. The M200 series offers two battery versions – a standard 95 Wh version and a more powerful version of 174 Wh with flight time of up to 38 minutes. The M200 series enables three different payload configurations – one downward-facing camera (M200), two downward-facing cameras (M210) and / or one upward-facing cameras (M210). DJI’s updated series of Zenmuse cameras is optimized for aerial imaging and communicates directly with the aircraft’s gimbal and flight controllers. For situations that require a balance between weight and image quality, the Zenmuse X4S has a 1-inch, 20-megapixel sensor with 11.6 stops of dynamic range and a 24 mm equivalent focal length. The Zenmuse X4S offers aperture control (f2.8-11) and a mechanical shutter capable of 1/2000 shutter speeds, eliminating rolling shutter distortion when taking images of fast-moving subjects or when flying at high speed. The Zenmuse X5S has a larger Micro Four Thirds sensor with 20.8 megapixels and 12.8 stops of dynamic range, and supports eight lenses from wide angles to zooms. DJI’s Zenmuse XT, powered by FLIR, provides high-sensitivity thermal imaging ideal for analytics and telemetry. DJI’s Zenmuse Z30 is the first integrated aerial camera with an optical zoom up to 30x and digital up to 6x, making image data collection significantly faster while greatly reducing the risk of harm to both personnel and equipment.